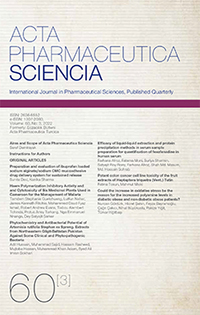 DOI : 10.23893/1307-2080.APS.05706 In this study, the compounds that contain active ingredients beneficial for health and disposed from t he fruits of milk thistle which from oil was extracted after cold press was obtained, and end products were provided. At this stage, total ash, insoluble ash in HCl, loss on drying, foreign matter, heavy metal and microbiology analyses were carried out on the milk thistle waste supplied as seeds. The seeds were treated to cold press, then oil and waste were obtained. Peroxide value, FFA, refractive index, fatty acid composition, saponification and iodine number were investigated in the oil. The waste had silymarin compounds signi?cantly, therefore verification was performed for the quantitation of silymarin active ingredient in the waste. The waste contained up to 2% silymarin.